Noel Coward’s supernatural comedy Blithe Spirit has continued to haunt the stage since it was first produced in 1941. This androcentric jeu d’esprit in which writer Charles Condomine is caught in a tug of war between his second wife Ruth and the ghost of his first wife Elvira (brought back after a seance gone wrong) shows Coward at his most light-heartedly whimsical ‒ though there is a more interesting undercurrent concerning freedom and commitment in relationships. Charles’s dilemma is rather like that of Elyot in Private Lives, of choosing between his reliable but dull new wife and his passionate but temperamental ex-wife ‒ or opting for an unattached life outside marriage. The summoning of Elvira (only visible to him) may be the result of a subconscious yearning for her, but Coward suggests he will never be satisfied with what he has. 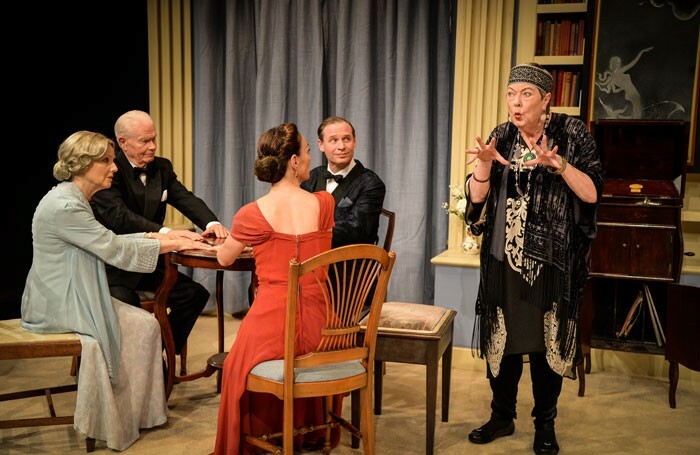 The play’s subtext is not really hinted at in Tam Williams’ straightforwardly entertaining revival, which has fun playing with the bitchy rivalry of the two women over a self-regarding male, as well as the paranormal conceit. Michael Holt’s elegant art deco-ish drawing room design incorporates some spooky stage effects. Darrell Brockis strains a little for suavity but suggests Charles’s weak-willed vanity. Phillipa Peak’s strait-laced, domineering Ruth is nicely contrasted with the feline sensuality and mischievous humour of Finty Williams’s Elvira, who glides around in ashen garb and ghostly pallor. And Elizabeth Power makes the most of medium Madame Arcati’s colourful eccentricity by taking seriously the whole hocus-pocus.